The Texas Law Review has published a student note by Ryan Phelps titled Protecting North America’s Past: The Current (and Ineffective) Laws Preventing the Illicit Trade of Mexican Pre-Columbian Antiquities and How We Can Improve Them, 94 Tex. L. Rev. 785 (2016). The piece is noteworthy mainly due to the prestige of the Journal, as the comment largely consolidates the arguments for advocating for more policing of the antiquities trade at the source and educating the buyers of illicit material at the market end. With the problem at hand, this Note suggests that the current laws and recourses available that protect and deter the theft of Mexican pre-Columbian antiquities and these artifacts’ illegal import into the United States are ineffective at their goal of reducing these types of crime. Instead, a new policy is recommended that focuses on the active preservation of these antiquities before they are looted in the first place. This policy will rely primarily on educating the people of Mexico and the United States about the damage that this illicit trade causes and the penalties for those involved in this destruction. 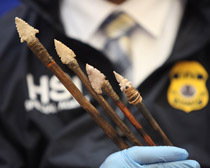 Specific groups of people will be targeted for this education, including people living in rural areas who may find or help transport stolen antiquities, border agents and tourists who may discover the antiquities as they are smuggled, museums and dealers who often serve as intentional or unintentional fences for these artifacts, and people involved in international transportation who may witness or take part in the trade. Yesterday U.S. law enforcement officials returned 4,000 object to Mexico. They are the fruit of 11 different investigations in cities like El Paso, San Antonio, Fort Stockton, Phoenix, San Diego, Chicago and Montana. These kinds of ‘art on the table’ news conferences are quite common. But I admit to feeling conflicted about them. On the one hand they certainly speak to the degree of seriousness with which ICE agents and the Federal Government take these crimes. But as with any crime that becomes federalized like this, the incentives are I think primarily geared towards rewarding these big investigations and successful returns. Yet the underlying problems endemic to the antiquities trade itself are not treated or targeted. It is an important step, but also the more of these returns I see (and there are a lot of them) the more frustrating it becomes as well. Because these investigations target the objects. There is no mention of arrests, prosecutions or of much of anything which would produced sustained compliance on the part of the art trade. Two issues need to be resolved before a loan can be arranged. The first hurdle is legal, since there is a long-standing Mexican law that forbids the re-export of any archaeological material from the country. Initially it was hoped that the headdress would not be regarded as archaeological, but the Vienna museum needs assurance that its return would not be blocked. A special presidential decree on the headdress was discussed, but this might not be legally binding on future presidents. The Mexican government is now considering a change in the law on the re-export of antiquities. Austrian and Mexican conservators also need to agree to the loan. The headdress was remounted on a display board in 1992 and cannot be easily detached. Conservators are reluctant to do so until a decision has been made on a new backing. This will depend on whether it has to be fit to travel. The feather vanes are fragile so a vibration-free case would have to be devised. Martin Bailey, Heading back to Mexico a step at a time, The Art Newspaper, March 10, 2011, http://www.theartnewspaper.com/articles/Heading+back+to+Mexico+a+step+at+a+time+/23243 (last visited Mar 10, 2011). Archaeologist Paul Barford has an interesting post on the sale of antiquities in Egypt. He’s had a number of interesting posts on his time on an excavation there, but I was really interested in his post Monday. He talks about his quest for some fake antiquities, and was offered some shabtis. These small funerary figurines were placed in graves, perhaps as servants meant to serve the deceased in the afterlife. Pictured here are shabtis on display in the Louvre. Barford states the “current modes of no-questions asked collecting are directly contributing to the creation of the market which is the motor behind the looting of archaeological sites for saleable objects.” I think I agree with him that buyers are fueling the looting of sites. But there are other contributing causes: the paucity of resources in these areas for law enforcement; the desire by visitors and tourists to buy these objects; and the lack of site security when archaeologists leave. The answer is responsible scrutiny of these transactions, but also the importance of outreach and education of these buyers and the local communities about the value of responsible stewardship of these sites and objects. Last night in a Luxor sidestreet on my quest for the best or the most bizarre fake artefacts, in a grubby shop I’d overlooked before, I was offered several shabtis and shabti fragments which I am pretty sure were not fakes. All the dealer offered as provenance was “here and there”. After I had correctly identified the fakes he’d mixed in to test whether his customer knew his onions, he showed me a lot more. I told him that in his country there was a new law under discussion which would make merely having them in his shop punishable by up to twenty five years. I was not terribly surprised that he would not show me the “authentic scarabs” after that. Those suppliers “here and there” who sold them to him knew that these items were saleable to visiting foreigners. The day before, I was walking across the palace site at Malkata, showing it to some colleagues, and had just replaced the cardboard “protecting” the wall paintings when a guy in a dark robe came running up. “Closed, closed, zis site he closed” he panted. He was presumably the “gafir” who was guarding this site for the SCA. Once he realised he could not make cash out of showing us the wall paintings which I’d just shown people, he then pulled out of his pocket a blue-painted sherd, the “Armarna ware” which I have seen on the Internet being sold at 300 dollars a piece and asked whether I would like to “see” it. It looked remarkably like the one I’d found there a few weeks earlier and put under a nearby bush to protect it from the sun and weather. I told him where he could put it. Interestingly this was after I had pulled out the photo-identity document issued by the SCA authorising me as an archaeologist to visit sites like this. What is interesing about this is Malkata is littered with pottery, tonnes of it. Most of it from the Eighteenth dynasty, including some nice red wares (lovely colours), slipped ware, fine bowls, burnished ware. Yet neither of the would-be vandors had picked any of this up, they knew their market, the blue-painted pottery is coveted by western collectors and that is what they were stealing from the site to make a bit of cash. . . .
I’ve had similar experiences at ancient sites as I’m sure many of you have. Pictured here is a man selling small stone ‘zapotec’ figurines at Monte Alban in Oaxaca Mexico this summer. I don’t have the expertise required to tell if these are fakes or not. I’ve always assumed, as Barford did, that these locals are selling fakes. Over the summer we were able to take a vacation for 10 days to catch up with some friends in Oaxaca, Mexico; an outstanding city and region with a lot of great culture (particularly food) to offer. 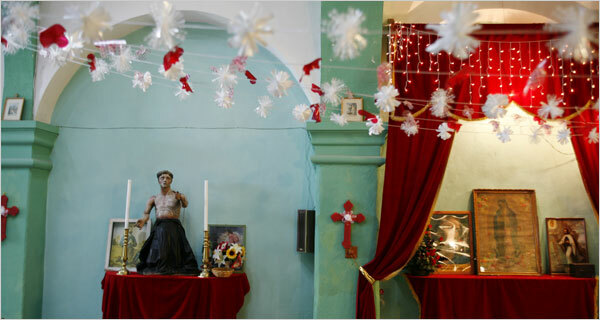 This museum is dedicated to the millenary art which flourished in the area call now-a-days the Republic of Mexico. Art entirely inspired (with the exception of occidental Mexico) by pre-Columbian religions and myths. It represents the deified forces of nature: the sun, the wind, the water and a multitude of other natural phenomena. But if in our time the pieces exhibited in the niches of this museum impress its visitors, it is not for religious feelings, because the religions of ancient Mexico a long time ago have been forgotten. Reather, they are moved by the aesthetic rank of the works, their beauty, power and originality. It is the first time that a Mexican museum exhibits the relics of Indian past in terms of aesthetic phenomena, in terms of works of art. Each of the rooms of the “Museo del Arte Prehispanico De Mexico Rufino Tamayo” presents—with a certain liberty—objects and sculptures of a specific region and a specific time. The painter Rufino Tamayo collected these pieces with a great love and artistic sense over more than twenty years, not only for his own pleasure, but also with the purpose of protecting them from exportation and illegal traffac and, first of all, with the wish of donating them to the people of Oaxaca, his native state. Tamayo left the museum to his native state, to make his countrymen aware of their cultural heritage, and to prevent these objects from being sold abroad. Tamayo was a Zapotec painter born near Oaxaca. He lived in New York from 1926 to 1959. In 1959 he returned to Mexico and soon after created this museum. The museum has a number of stunning works, from all over Mexico. But going through the museum, I was left wondering what the difference between Tamayo and certain other high-profile buyers of antiquities may be. How is Tamayo, and his archaeological museum any different from what Robin Symes may have done for example? They are different, but there are some troubling similarities as well. I think the one difference is Tamayo acquired these objects and kept them in Mexico, though not necessarily their region. He was preventing the loss of these works of art abroad. But were these objects excavated by archaeologists? The museum visitor is not told. There’s nothing inherently wrong with that I don’t think, I mean not every museum needs to focus on the antiquities trade. But certainly there is not a lot of information provided to the museum-visitor. We are told in broad strokes where these objects came from, what culture produced them (Maya, Aztec, Zapotec, etc.) but you don’t’ get a sense these were objects that were excavated by archaeologists. Rather these are objects which are exhibited for their beauty, to show off the impressive works that were created before Europeans arrived. Displaying these objects sends a powerful message to locals and visitors; just like displaying them in New York or London would send a very different kind of message. In Mexico, they are a symbol of national and indigenous pride. If they were displayed in New York, they might be seen as a cultural appropriation, or even a sign that Mexicans are unable to properly care for their own works of art. Mexico and its cultural heritage laws have played a vital role in cultural heritage law. I wonder as well if part of the impetus for those laws was supported by efforts like the Tamayo pre-hispanic museum. Mexico has strict export restrictions for art and antiquities, as well as a number of agreements with the US for enforcing those agreements. One of Mexico’s first efforts to safeguard its cultural heritage was the enactment in 1916 of the Law on the Conservation of Historical or Artistic Monuments, Buildings, Churches and Objects. In 1972, Mexico—probably in response to the recent UNESCO Convention—enacted the Federal Law on Archaeological, Artistic and Historical Monuments and Sites which defines illicit traffic of cultural patrimony as the import and export of cultural property that is stolen or not given official permission to leave the country. Of course the important McClain prosecutions in the U.S. were a response to the theft of pre-Columbian objects from Mexico. In the McClain cases (United States v. McClain, 545 F.2d 988 (5th Cir. 1977); United States v. McClain, 593 F.2d 658 (5th Cir. 1979) The defendants were convicted under the NSPA for stealing pre-Columbian artefacts from Mexico, and selling them in the United States. This group of art dealers and appraisers created a network in Mexico where artefacts were taken from excavations to the Mexican Archaeological Institute; they were then given false papers and backdated before 1972 in an attempt to give them clean provenance. The objects were then taken across the border to Calexico, California where they were sold. These actions ultimately raised the suspicions of the director of the Mexican Cultural Institute, which informed the FBI, resulting in an undercover investigation. A Mexican law passed in 1972 nationalized ownership of undiscovered pre-Columbian artefacts. As a result, the provenance and date of discovery of the objects was an important potential issue. However, in the first conviction, the government presented no evidence as to how and when the objects were discovered or exported. The first prosecution, often termed McClain I, dealt with the vesting of ownership of antiquities with Mexico, with the court considering the definition of “stolen” under the National Stolen Property Act in the United States. It determined that the term should be given a broad meaning and remanded to the district court the issue of when precisely the objects were exported from Mexico. Although the prosecution argued that an 1897 law accomplished state ownership, the court held title did not completely vest with Mexico until enactment of the 1972 law, because only then did Mexico declare ownership of all pre-Columbian artefacts. The jury had not been instructed to determine when any of the pre-Columbian objects at issue had been exported from Mexico, or how to apply the relevant Mexican law to the export. Because of the improper jury instruction, the court remanded the controversy back to the Federal District Court. Although a temporary victory for the defendants, McClain I firmly established the applicability of the NSPA to pieces of cultural property emanating from nations which had vested title to these objects in the state, even where the objects have never been within the physical possession of the foreign government. On remand, the defendants were once again convicted of violating the NSPA, and of conspiracy to violate the act. At the retrial, the prosecution was required to establish beyond a reasonable doubt that the defendants knew they were selling stolen objects. In McClain II, the court upheld the conspiracy conviction due to overwhelming evidence that the defendants intended to smuggle Mexican artefacts, clearly violating the 1972 Mexican Act, and by implication the NSPA. However, the conviction under the NSPA itself was overturned because of due process concerns. The District Court Judge and not the jury must determine questions of foreign law. As the 5th Circuit Court of Appeals reasoned, the most likely interpretation of the evidence by the jury led to the conclusion that Mexico deemed itself the owner of its pre-Columbian objects as early as 1897. However, that act was too vague to impose criminal liability upon a defendant under the “jurisprudential standards” of the United States. The conviction of the McClain defendants for conspiracy to violate the NSPA firmly established that individuals may be convicted under the NSPA for dealing in objects that foreign states have nationalized. This ownership interest will be enforced by U.S. courts, despite the absence of any actual possession of the object by the foreign state. Simon Usborne has an extended piece for the Telegraph examining the difficult task UNESCO has in selecting and preserving heritage sites. A number of pressures make this a difficult task, from too many visitors to looting to environmental or other factors. Pictured here is Monte Albán near Oaxaca, Mexico. The site is reportedly under threat as its carvings are exposed to the elements, it has been looted, and a nearby fire damaged it in 2006. The site is a World Heritage Site, which brings visitors and attention, but not perhaps enough resources for protection, preservation or crowd management. Bandarin suggests a solution would be to maintain a central committee, but to break some of the bureaucracy by handing partial autonomy to an “effective network of heritage institutes”. Unesco has launched a review of its practises and Bandarin expects big changes by 2012, when World Heritage turns 40. “It’s the only way we can cope with the crazy volume of work,” he says. There is a report in the Dallas Morning news on the repatriation of 100 pre-Columbian objects to Mexico, many of which were of museum-quality. A treasure-trove of about 100 artifacts, believed to be pre-Columbian, is on its way to Mexico, its presumed home, U.S. customs agents and Mexican diplomats said Tuesday. Among the antiquities is a stone mask of a broad-featured man, which is believed to come from the Olmec civilization, the oldest in the Americas, and it dates as far back as 1000 BC, experts said. Other items include figurines in jadeite, precious stones symbolically linked to fertility for the people of ancient Mesoamerica and once valued more than gold. One of the most stunning pieces is the mask, Mr. Rea said. But when the experts at Mexico’s National Institute for Anthropology and History unpack the goods, they may unravel far more significant mysteries, as authentication deepens, he said. “They may find something of incalculable value,” Mr. Rea said. Equally mysterious is the trajectory of the smuggled artifacts into the Dallas vaults of U.S. Customs and Border Protection. The goods represent several seizures in Texas and New Mexico, including an initial seizure in 2001, said Carlos Fontanez, a CBP spokesman in the Houston office. But Mr. Fontanez gave few details to the whodunit tale. No one has been charged with smuggling the goods into the U.S., he said, though it is illegal to traffic in antiquities under U.S. law. It’s an odd story, as there is no indication of how or under what circumstances these objects were seized. Dealing and importing these objects is of course illegal; one wonders why there was no arrest, and also why it took so long to return them to Mexico. One possible answer is the objects were being held for possible prosecution or criminal charges.